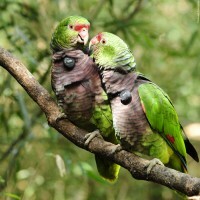 Since 2010, Instituto Espaço Silvestre has been dedicated to the Vinaceous-breasted Amazons (Amazona vinacea) reintroduction project, which has a long-term goal to establish a viable population at the Araucárias National Park (ANP), Brazil. We have rehabilitated, released and monitored amazons, victims of illegal wildlife trade and born in captivity, improving animal welfare and allowing them to play their ecological roles while contributing to species and habitat conservation. Up to date, 113 amazons have been released: 13 birds in January 2011, 30 birds in September 2012, 33 birds in June 2015, 7 birds in March 2016 and 30 in June 2017. This is the story about two parrots who have been living freely since the last release. In early 2017 we had received in Itajaí city, where our headquarters is located, 49 Vinaceous Amazons from environmental agencies and zoos for rehabilitation and possible release. 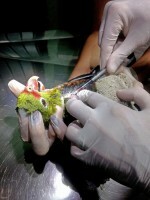 All birds were identified by rings and microchips. Among them there was ‘PA 2155’, one of 3 birds sent by Parque das Aves, a zoo is Paraná state, where she was born in 09/10/2011 from parents who were victims of the illegal wildlife trade or rescued. There was also ‘IES 22’, a male amazon received from the environmental police of Lages, a municipality in Santa Catarina state. Because he was kept illegally, we do not know much about his history or age. During quarantine, biological samples were collected in order to perform genetic analyses and extensive screening suggested by the ICMBio Normative Instruction 23 (clinical examination; ectoparasite search; haemoparasites investigation; 3 parasitological faeces examination, Coronavirus, Influenza Type A, Mycoplasma, Newcastle Disease, Herpesvirus, Circovirus, Adenovirus, Chlamydia, Salmonella, Bornavirus, Megabacteriosis and Polyomavirus by PCR Real Time). A total of 9 birds tested positive for Capillaria sp., 3 for Heterakis sp. and 10 to Eimeria sp. After treatment, the parasitological faeces examination tested negative (3 x in 15 day intervals) for all of them. All 49 parrots tested negative for all other laboratory exams and were considered healthy to begin behavioural rehabilitation as a group. When gathered in a large enclosure with nest boxes, many of the birds paired up and one couple had an offspring which was considered a release candidate as well, increasing our group to 50 healthy birds. PA 2155 and IES 22 were introduced to each other during this time, but they did not interact a lot. The group presented antipredator behaviour in the presence of large birds and birds of prey who flew over the rehabilitation enclosure. Human aversion training lasted 47 days, resulting in progressive improvement for all birds, and none approached the trainers. 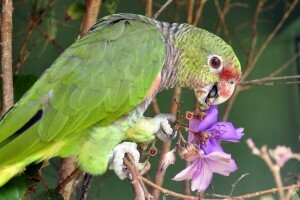 Amazon parrots were offered 81 food items, such as flowers, leaves, fruits and seeds and had no problems learning how to recognise and handle them. Ten parrots were considered not suitable for the 2017 release because they had physical deformities or trimmed flight feathers. Thus, 40 were evaluated during the flight ability test, in which five failed, and 35 began daily flight training. The test was repeated 55 days later, when 30 individuals demonstrated satisfactory skills for release. Ten of them received fake radio-collars so they could practice flying with the extra weight, including PA 2155 and IES 22. The 30 candidates who met the health, genetics and behaviour criteria were transported by car to the ANP on 18/06/2017 where they stayed in an acclimation enclosure in the forest. The fake radio collars were substituted for real ones, allowing our team to monitor them by radio telemetry. The soft release process began in 24/06/2017, once their behavioural patterns were similar to those observed during rehabilitation. One side of the enclosure was opened every morning and closed at night, allowing birds to come and go as they pleased while being monitored. This process lasted 14 days until every bird left and did not return. The monitoring has been carried out daily by radio-telemetry, drone, camera traps placed in strategic locations, visualisation, listening for vocalisations, and reports from citizen scientists. 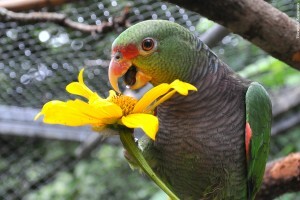 Supplemental feeding platforms were maintained until December, when parrots were no longer using them. They were re-activated by late pinhão season, when some individuals returned to the area, probably due to the limited availability of this important food source, once people collect these Araucária seeds indiscriminately. In 14 months of monitoring 8 deaths were recorded (2 predation by wild mammals, 1 by a domestic mammal, 2 by birds of prey, 1 by a wild animal not identified, 1 death by unidentified cause and 1 was electrocuted) totalling 26% mortality (mortality confirmed since the beginning of the project: 19.7%). Other reintroduction projects find mortality rates that range from 16 to 41%. The dispersion occurred irregularly such as some birds left the release area in the first days while others remained in a large group that has been fragmenting over the months. 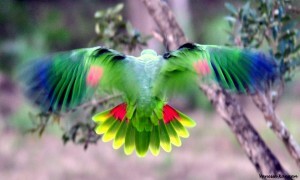 Vinaceous Amazons were recorded in over 20 different locations, such as that one bird moved more than 20km. Social behaviour is very distinct between pinhão season, when Vinaceous-breasted Amazons stay in large groups, and breeding season, when they are often observed as couples and later as small groups of 3-5. Although pairs were observed, including one formed by two males, we did not record any offspring during the breeding season of 2017. PA 2155 and IES 22 were part of a group formed initially by 8 individuals that stayed together since the release and they have been giving signs that the 2018 breeding season may be different. They have been together for over one year and recently started to show pairing behaviours, aggression towards others in the group and they are foraging as a couple. Their radio-collar batteries will not last much longer, so we may have difficulty identifying and monitoring them soon. Nest boxes were placed in the areas where they have been seen and a few days later, they were checking out the new forest furniture. If they breed we may be able to equip at least one chick with a radio collar and continue to monitor the family for 18 months. Who is cheering with us for baby news? Currently, there are 97 amazons in rehabilitation. Ten of them did not meet the release criteria and will be sent to zoos or other licensed facilities, as determined by the state environmental agency discretion. The next release of about 40 individuals was scheduled for March 2018, but due to the federal environmental agencies bureaucracy it probably will not happen until late September or early October. The remaining birds will be considered for a release in the first semester of 2019. Our actions were not limited to the birds. In the past year, our environmental educational program has focused on capacitating local teachers and distributing Activity Guides in order to help them to work environmental issues in the classroom while reaching a greater number of children than our team could. Through visits and questionnaires we learned that the material was widely used and gathered feedback on how to make it better. One example of how the impact was much greater than we anticipated was the fact that one school chose the Vinaceous-breasted Amazon as their theme for the Independence Day parade of the Passos Maia municipality. We also continued to disseminate scientific knowledge at the local, national and international levels through visits to properties, presentation of seminars, publication of our monthly newsletters, updates to our website and social networks, publication of articles in magazines and specialized journals as well as through attendance and presentations in congresses such as the Brazilian Congress of Protected Areas, Brazilian Society for Zoos and Aquariums and Brazilian Congress of Ornithology. Thanks to the donation made by The Parrot Society UK and all its members we were able to release and monitor 30 Vinaceous-breasted Amazons, while rehabilitating almost 100 birds for future releases. We also continued the income generating project for local women and A. vinacea Safety Network, engaging important stakeholders in the conservation and well-being of released Amazon parrots and local wildlife. We have reached over 2 million people worldwide with our educational activities. Hopefully we can continue counting with your support to monitor PA 2155 and IES 22, their offspring and give the opportunity to many other amazons to live love stories in the wild while saving this species from extinction. Further updates will be received by Vanessa in due course.